Bob Truswell initially moved into cricket coaching to help his son's team. So, how do you become a minis cricket coach? Well, a long background in junior rugby is essential if Glapwell Colliery Cricket Club coach, Bob Truswell, is anything to go by! Bob's son, Dan, has played Kwik Cricket for Glapwell since he was six years old. Bob enjoyed kicking back in a deckchair and watching training sessions. Unfortunately, the minis coach departed suddenly leaving a group of a dozen or so players at risk of having no cricket. As part of a group of parent helpers, Bob stepped in to get the players through the season. Bob Truswell (right) with young Glapwell cricketers. The following season, Bob was asked if he could lead the section. With years of coaching experience behind him, but being a novice at cricket, this was quite a challenge. But, with the support of dedicated helpers, the club was able to put on planned, interactive, fun sessions for an ever growing group of players from school years 1 to 6. Some of the youngsters getting into cricket with Bob's help. 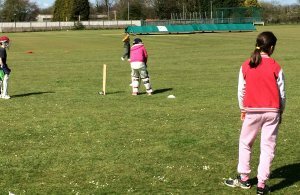 Sessions focussed on core skills with a mix of agility, balance and co-ordination and technical cricket skills around batting, bowling and fielding. Sessions are game based with an emphasis on learn by doing. This very much reflects the club ethos. 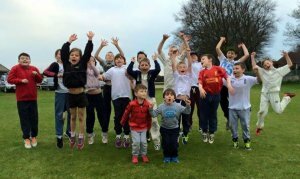 As a club, Glapwell aim to provide a secure, safe and inclusive environment for the kids to enjoy and learn the sport they are playing with it being available to all the local community to use. The juniors section is the club's future so is of paramount importance. 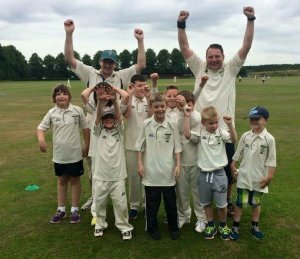 The Kwik Cricket team entered the local festival league and lost every single game in their first season. The second season came round and they were delighted to secured their first win... and then another, and another! Games are always played with a smile and players try their hardest and look forward to a hot dog afterwards. 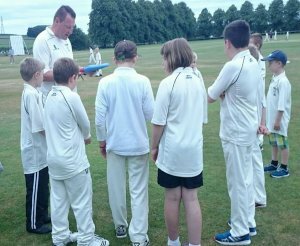 Bob realised that his coaching skills were not keeping pace with the abilities of the players so he registered for his Cricket Level 2 badge with Derbyshire Cricket Board. Coaching Derbyshire assisted with this and were able to provide a bursary towards the costs of the course. Bob is nearing completion of his practical sessions and will soon be a qualified Level 2 Cricket coach. 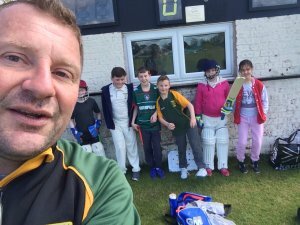 Some of the original cohort of players, are now too old for Kwik cricket so for the first time in many years, the club has entered a team in the North Derbyshire Youth Cricket League's Under-13 Hardball section. This is a massive step into the unknown but the players and coaches will approach it with the same enthusiasm and determination as they did all those years ago with Kwik Cricket. Bob is developing his cricket coaching skills by assisting Derbyshire Cricket Board coaches with their "Chance to Shine" programme. Most recently, Bob has accompanied Matt Brindley from DCB to deliver fun sessions for children in Years 4 to6 at New Bolsover and Scarcliffe Primary Schools. Bob gives out instructions to the youngsters. With over twenty red and orange ball players regularly attending training, the future is looking bright for the club and coaches. Rugby has not taken a back seat as the cricket and rugby seasons dovetails perfectly. 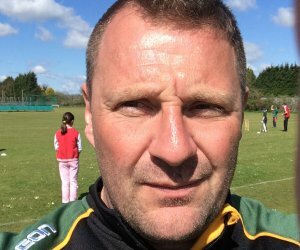 Bob is a longstanding coach of the Notts, Lincs and Derbys RFU Girls Under-13 squad and was recently called in to help with reffing the Bolsover Schools Sports Partnership Tag Rugby tournament heats and finals at Chesterfield Panthers Rugby Club. As he jokes, who needs a day off on Sundays, anyway?